Enjoying sitting outdoors around a fire doesn’t have to end when summer does. It is a way of life, a way of being, all year round. Firepit-online.com has everything you need for those pleasant moments around the fire. That can be indoors, in front of the fireplace. Or outside around fire pits and fire bowls. For simple cooking in cast iron pots. Or to simply enjoy the heartwarming flames. Read more about fire pits here. Nik Baeyens Fire basket "Fire Walk With Me"
Buy fire pit? Then you have come to the right place at Firepit-online.com! When the days become shorter and the evenings cool off faster, then a fire pit really is a great solution. A fire pit does not only bring warmth, but a warm ambience as well. The dancing flames will captivate everyone. Entertaining friends or family around the fire, roasting marshmallows, tell stories, or just read a book. A real camping experience, in your own backyard! A fire pit is not only for summer evenings; in spring, autumn or on winter days, too, a fire pit will brighten up your terrace! Fire pits are popular decorative objects for the garden. Not only because they create a pleasant ambience, but also because they are compact in size and easy to use. With our wide product range there will be a fire pit for any style garden or outdoor fireplace . All fire pits have their own unique appearance. There are traditional round fire pits, square fire pits, fire pits made of cast iron and fire pits made of corten steel. You will find all of them with us! In addition to fire pits, we also sell fire rings. These products are very similar, but there are a few differences. Fire pit generally stand on legs, whereas a fire ring is placed directly on the ground. A bottom plate is a very practical accessory. It will make sure that ash residue lands on the plate instead of on your terrace. This will keep your patio clean. Here are some maintenance tips that will extend the time you can enjoy your fire pit. This will keep the fire pit clean and will prevent it from having to be replaced every year. 1. If you want the fire pit to remain black, then paint it after a while, using a black, heat-resistant paint. 2. Ignite the fire pit with fire starters, kindling wood or kindling briquettes. 5. Place fire pits on a flat surface and use a metal bottom plate. It will catch all ash residue. 6. Wait with cleaning until the fire pit has fully cooled off. 7. Wipe the fire pit immediately after cooling. 8. Ash residue can be thrown away or serve as fertiliser in the garden. Are you convinced? Then order your beautiful fire pit now! The choice of cheap fire pits is enormous. 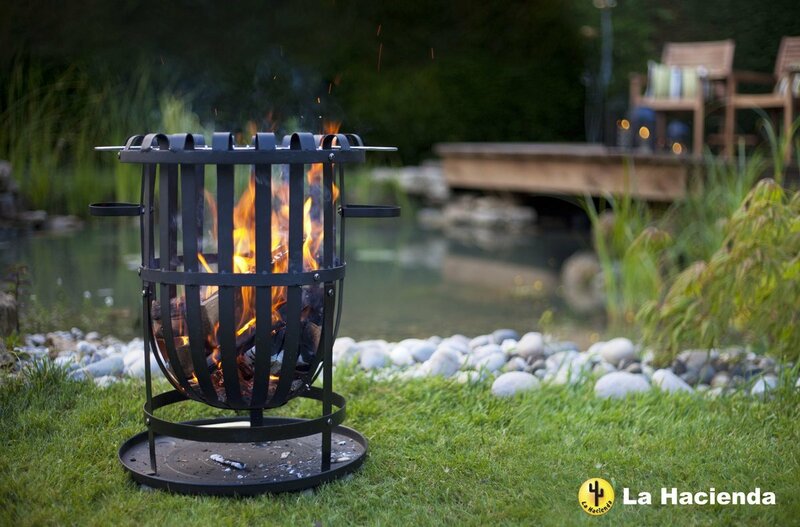 A traditional fire pit, for example, is already available from € 15.00. When you have made your decision, you can order your fire pit online. If you order before 17.00h, your order will be shipped still the same day for delivery within a few days!